When my friend and fellow foodie, So How's It Taste?, told me about these I HAD to try them. I had a ball of pizza dough that I bought at Publix in my freezer just waiting to be turned into these. 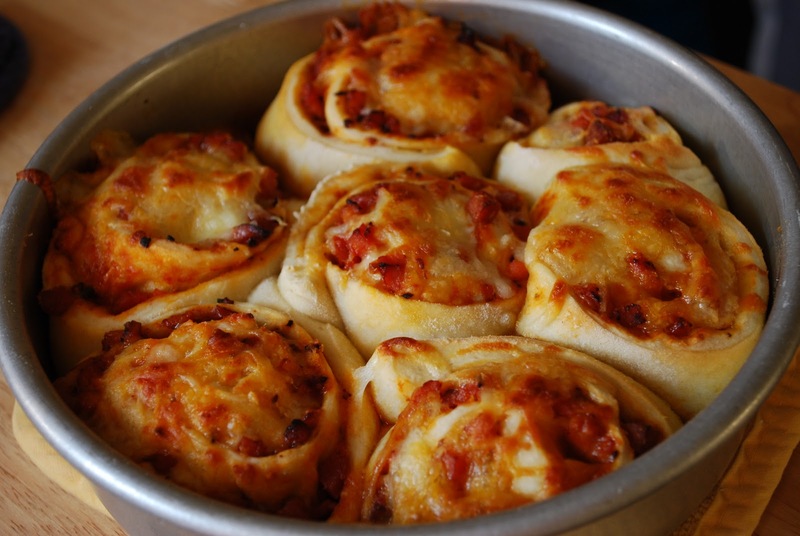 From the brilliant mind of One Particular Kitchen, these homemade pizza rolls are a perfect snack/lunch/dinner food. One of the best thing about these pizza rolls is that you can customize them anyway you want. I, of course, went the meaty route, with diced pepperoni, diced ham and crumbled sweet Italian sausage. I made them on a weekend and I was really surprised how quick and easy there were to prepare. A perfect food for sitting in front of the TV watching football! Since I am not that great with photography and even worse at step by step photography, head over to One Particular Kitchen to get the lowdown on making these delicious pizza snacks! Pizza Dough (the best is from the deli section at Publix) or you could make your own. Roll out the pizza dough into a rectangle and then spread pizza sauce over the dough. Sprinkle on your pizza toppings. Gently roll up the dough. With the dental floss, you will cut slices of the rolls. Slide the floss under the rolled dough, cross the ends over the top like you are going to tie a knot and then pull the ends all the way through the dough so that the floss is straight again. The purpose of the floss is so that you will have a nice, clean cut roll. Place the rolls in a greased baking dish. Shannon, those pizza rolls look great! I wished I had some right now! They would be a perfect midnight snack!